Ongoing attacks by the Sudanese Armed Forces and supported militias have driven hundreds of thousands of refugees into South Sudan from their homes in the Sudanese border states of Blue Nile and South Kordofan, where conflict reignited in June 2011 between Khartoum and SPLA-North, the northern remnant of the southern liberation movement. 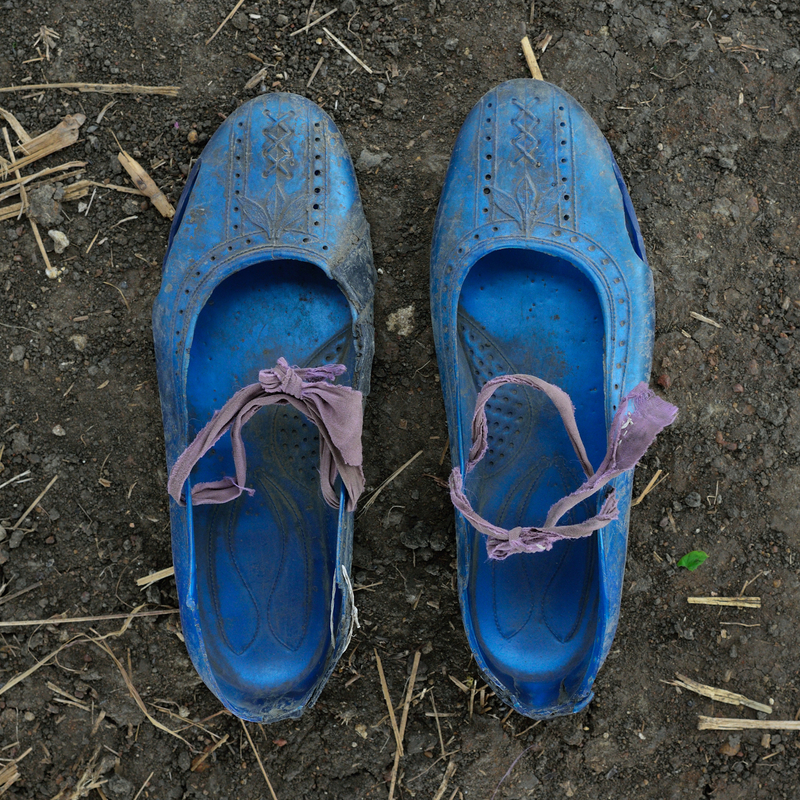 I was present at the border of Blue Nile during an influx of 30,000 men, women and children in June 2012. Many had never left the vicinity of their villages before shelling, aerial bombardments, and soldiers drove them away the previous September. For months, families traveled back and forth from the forest to the mountains, rarely spending more than a week in one place, until they finally made the long trek to South Sudan’s northern border. With them, they carried stories of grandparents left behind and brothers who never returned from fetching water; days in hiding and nights of walking; treasured possessions lost and herds of livestock stolen. These are the shoes that made the journey. The incredible array of worn-down, ill-fitting, and jerry-rigged shoes formed a silent testimony to the arduous nature of the trek, the persistence and ingenuity of their owners, and the diversity of these individuals thrown together by tragic circumstance. Biographical details are provided for each pair, but the individual is left out of the frame. The viewer is asked to imagine the person whose feet were in these shoes. A fundamental goal of this work is to encourage a genuine human connection to someone else’s experience. The overwhelming response to this work by ordinary viewers has shown me that it achieves that, but I’d like to push that goal one step further through an unusual book collaboration. Just as people can become numb to typical images of suffering from places far away, they also grow numb to accounts of atrocities and hardships, which is one of the reasons I generally do not include extended caption information with this work. I am hoping to return to the camp (as I did in March 2013) with an accomplished fiction writer to interview the refugees and write a series of vignettes or short stories based off of their experiences: painting a picture of life at home as well as the journey and refugee experience, painting a picture of them as human beings rather than mere victims (in the spirit of Dave Eggers’ What is the What for example). I know this is an unusual endeavor, but I would like to publish the images in a book alongside those vignettes and appreciate any funds that would help me underwrite a return to the camps for that purpose. Born in Bethesda, MD, Shannon Jensen studied economics at the Wharton School, University of Pennsylvania, graduating in 2007. From 2009 – ’11, she worked as a photojournalist based in Nairobi, Kenya, and is a featured contributor to Reportage by Getty, having started on their Emerging Talent roster in 2011. She has received numerous awards, including from Amnesty International, Pictures of the Year International, and Days Japan. Among others, her work was screened at the LOOK3 Festival of the Photograph, and is included in the Open Society Foundation’s 2014 Open Walls exhibition. She is currently based between London and Seoul.